Introduction: The actual trends in surgery are the application of minimally invasive techniques. Nowadays laparoscopy has become the conventional and choice procedure in the treatment of some pathologies such as cholelithiasis. More recently, looking for minimally invasion and “no scar” procedures, surgery has begun to use the natural orifices as entrance pathways. Some examples of these procedures are the transgastric and transvaginal cholecistectomy, transvaginal nephrectomy, etc. 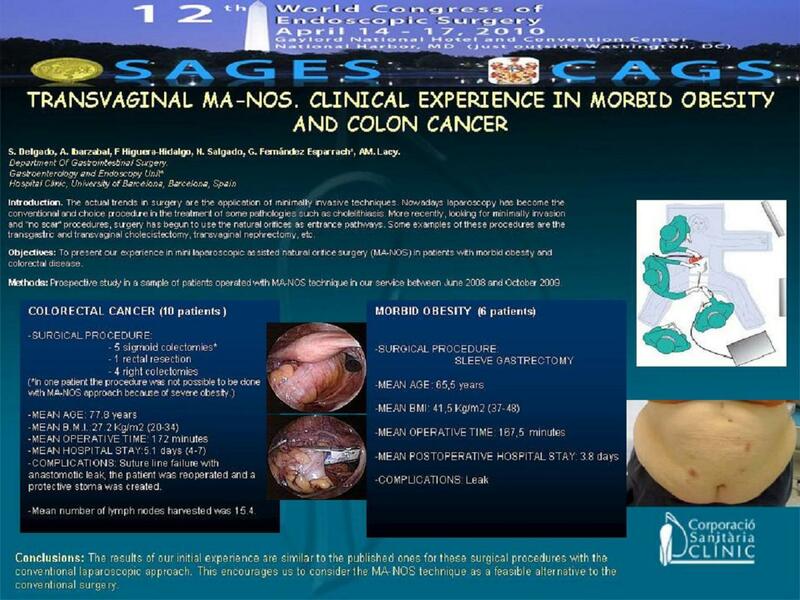 Objectives: To present our experience in mini laparoscopic assisted natural orifice surgery (MA-NOS) in patients with morbid obesity and colorectal disease. Methods: Prospective study in a sample of patients operated with MA-NOS technique in our service between June 2008 and October 2009. Results: 16 patients were operated; the sample was divided in two groups. In Group 1 we included 6 patients with morbid obesity (MO). In these patients a Sleeve gastrectomy was performed. Group 2 with 10 patients diagnosed with colon cancer (CC), where 5 sigmoid colectomies, 1 rectal resection and 4 right colectomies were performed respectively. In one patient the procedure was not possible to be done with MA-NOS approach because of severe obesity.Group 1 (MO) presented a mean age of 65.5 years, 5 patients presented more of 2 co-morbidities, the mean B.M.I. was 41.5 Kg/m2 (37-48), the mean operatory time was 167.5 minutes (110-245), mean postoperatory hospital stay was 3.8 days (2-10). A complication was present with a failure in the mechanical suturing device with a post operatory suture line failure. Group 2 (CC) presented a mean age of 77.8 years, mean B.M.I. was 27.2 Kg/m2 (20-34), the mean operatory time was 172 minutes, the mean post operatory hospital stay was 5.1 days (4-7). A post operatory complication was present with suture line failure with anastomotic leak, the patient was reoperated and a protective stoma was created. Mean number of lymph nodes harvested was 15.4. Conclusions: The results of our initial experience are comparable to the published ones for these surgical procedures with the conventional laparoscopic approach. This encourages us to consider the MA-NOS technique as a feasible alternative to the conventional surgery.